2 tbsp. butter or marg. Saute garlic and onion in butter until tender and golden brown. Add mushrooms; cover and simmer 3 minutes. Stir in tomato sauce, salt and pepper, simmer gently another 5 minutes. Combine flour, salt and pepper; dredge liver slices. Brown liver in butter. Pour sauce over liver, cover and simmer for 5 minutes. 6 servings. 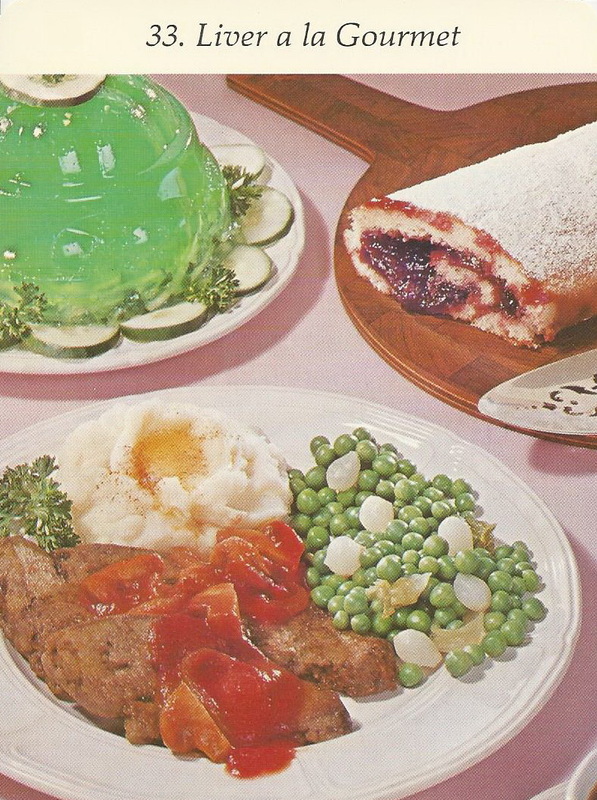 Early in the day or day before make Jellied Lime-Cucumber Salad and Jelly Roll or buy Jelly Roll. 5:40 Combine Liver and Sauce. Cook Slowly. After dinner serve Jelly Roll. *May be prepared early in the day and refrigerated. Welp. I was all set up to snark (with a name like “Liver a la Gourmet” who could resist?) but it actually looks GOOD! Good looking photos=1; horrendous looking photos=infinity.